Prem Sikka says auditors are dodging their duties, following a Parliamentary grilling of the sector this week. 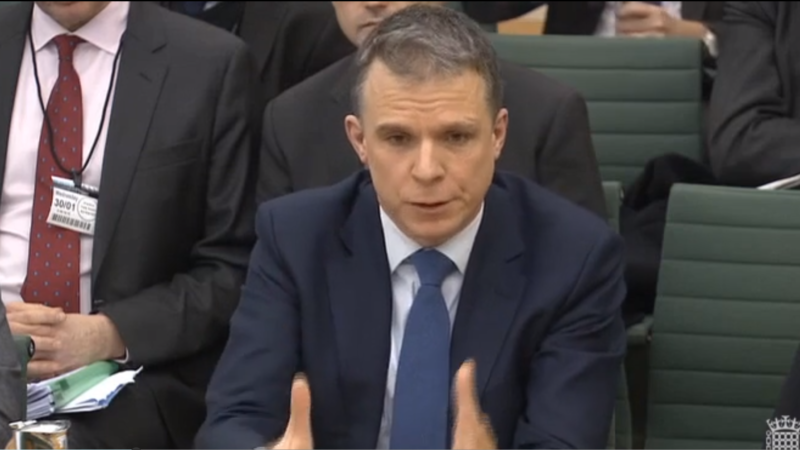 Pic: The new Grant Thornton boss David Dunckley giving evidence this week. The list of failures is practically endless. Now auditors’ handling of Carillion, BHS, Tesco, Manchester Building Society, Connaught, Quindell, banks and other firms has finally persuaded the House of Commons Business, Energy and Industrial Strategy (BEIS) Committee to examine the future of this murky world. The Committee recently took oral evidence from partners in the biggest accounting firms. They all excelled at saying what an audit is not about…and said little about what they actually deliver. One of the witnesses for the BEIS Committee was the Chief Executive Officer of Grant Thornton (GT), the firm that audited Patisserie Valerie (PV). PV has found thousands of false accounting entries, secret bank accounts, overstated profits and cash flows, possibly for a period going back more than three years. Yet GT always gave the company a clean bill of health. A GT partner told the BEIS Committee: “We are not looking for fraud. We are not looking at the future. We are not giving a statement that the accounts are correct. We are saying they are reasonable. We are looking in the past and we are not set up to look for fraud”. Note the emphasis on the negative. The testimony to the Committee cannot be reconciled with legal or regulatory positions on auditors’ duties. The duties and responsibilities of auditors are based on a combination of statute and common law. The first port-of-call is the Companies Act 2006. It does not say that the auditor is not required to look for fraud or look to the future. The Act requires directors to prepare accounts which show a “true and fair view”. Section 495 requires the auditor to form an opinion and state whether “the annual accounts give a true and fair view, have been properly prepared in accordance with the relevant financial reporting framework, and have been prepared in accordance with the requirements of the Act”. Common sense would suggest that accounts based on thousands of false entries cannot be considered to be “true” or “fair”. Unlike directors’ duties, auditors’ duties are not fully codified in statute. Therefore, one must look at legal cases. The cases have emphasised that auditors need to exercise ‘due care and skill’ and scepticism in conducting an audit. This is summed up in the case of Fomento (Sterling Area) Ltd. v Selsdon Fountain Pen Co Ltd . The judge said that an auditor’s “vital task is to take care to see that errors are not made, be they errors of computation, or errors of omission or commission, or downright untruths. To perform his task properly, he must come to it with an inquiring mind – not suspicious of dishonestly, I agree – but suspecting that someone may have made a mistake somewhere and that a check must be made to ensure that there has been none”. This requires auditors to take active steps to uncover “untruths”. Reflecting the case law, the auditing standard issued by the UK audit regulator states that an auditor “is responsible for obtaining reasonable assurance that the financial statements taken as a whole are free from material misstatement, whether caused by fraud or error”. None of this supports the GT partner’s assertions or absolves auditors from taking active steps to report fraud or misstatements. On 31 January 2019, in the case of Assetco Plc v Grant Thornton UK LLP, the High Court awarded £21m damages against Grant Thornton for failing to do adequate work to detect and report material fraud. In court, the judge noted that “GT did not suggest that the identification of fraud was irrelevant to its duties”. So why did GT adopt a different position in front of MPs? The auditing industry has made numerous attempts to obfuscate auditor responsibilities to “look at the future”. The auditor has a clear obligation to do so. There are two broad bases for preparation of annual company accounts. Firstly, it has to be assumed that the business is a going concern – i.e. that they’re in it for the long haul. If so, then assets, liabilities shown in the balance sheet can be assigned market and other. If a business is not a going-concern then accounts need to be prepared on a liquidation basis i.e. assets such as inventory may only have scrap value and the realised value of assets may be lower because of a possible sale under distress. Most company accounts assume, unless evidence suggest otherwise, that at the balance sheet date the entity is a going-concern and will be able to conduct its business and renew its assets, liabilities in an orderly manner for the foreseeable future, which is at least twelve months from the date of approval of the financial statements by directors. The accounting rule necessarily requires the auditor to examine company’s cash flow, cash/profit forecasts, borrowing, liquidity, structure of liabilities and other data for the future. So once again, the GT assertion is not supported. Audits have become a cruel deception on people. Auditors collect vast fees and deliver little. In all this, we should remember that auditing firms are a means to an end: to promote confidence in businesses and protect people from financial frauds and fiddles. As auditing firms deny even a modicum of social responsibility, we need to develop alternative arrangements.